‘Freeways’: Research connections from Rosa Parks, Helen Paris & Leslie Hill, to ‘Speed Sisters’ (2015). I drove along the I10 freeway each day. On the sat nav system the road name came up as ‘I10 – Rosa Parks’ Freeway’. It took a couple of days before I registered the name and began to wonder precisely why a freeway had been named after Rosa Parks and to ponder the idea of ‘freeways’. Parks was an amazing woman – an African-American civil rights activist who famously disobeyed a bus driver in 1955, refusing to move from the front seat of a bus which was reserved for ‘whites only’. 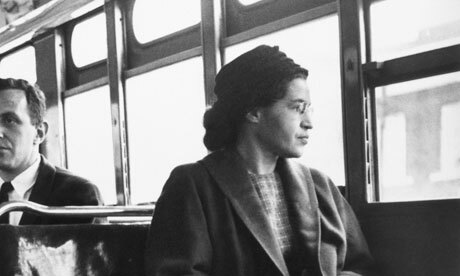 Her actions that day became a symbol of resistance to racial segregation, which led to a boycott of the Montgomery bus system and the eventual overturning of segregation laws the following year. The I10 is one of group of five roads that have been named after Rosa Parks. The most interesting of which is the I55, which runs from St. Louis to New Orleans. The story of this naming is particularly interesting. In the US, there is an ‘adopt-a-highway’ scheme in which a local organisation or business pays for the clean up of the highway as an example of their philanthropy and advertisement of their patronage. According to ‘Snopes.com’, the story goes as follows: In the mid 1990s, a Ku Klux Klan member wanted to adopt a stretch of the I55 that runs through Missouri. The Missouri Department of Transport rejected the application on the grounds that they didn’t want to ‘further or subsidize racial discrimination’. When this went to court, a District judge ruled that it was unconstitutional not to allow the Klan to participate and ‘the state had to erect signs announcing the Klan’s sponsorship of a portion of I-55’. In reaction to this defeat, the Missouri Legislature voted to name the road the ‘Rosa Parks Highway’ as an act of resistance to the KKK’s adoption, and the racial hatred they represent. Though the I10 Freeway I drove along wasn’t this precise stretch of motorway, I liked this story and the idea that the road I was on connects with all of this history of ‘freeways’ – of resistance and subversion – and of freedom; A freedom hard-won and fought for by so many, and that was so succinctly symbolised in an act of defiance by a woman. Though it’s a much smaller idea of freedom, having a car and being able to drive myself along this road is a symbol of my own freedom. That reminded me of Helen Paris and Leslie Hill (Curious’s) I Never Go Anywhere I Can’t Drive Myself (1997). I need to reconnect with that performance/documentation. They also wrote an article about this performance and the concept of ‘placelessness’ and online performance in Performance Research 3(2) (1997), titled ‘I Never Go Anywhere I can’t Drive Myself’. I’ve included a link to the online version of the article, but it’s behind a pay wall/institution login. Sorry about that. Let me know if you really want a copy and I’ll hook you up (I could read it to you?). I was on my own journey – the daily I10 and other places, but also the journey to LA and back again, over Christmas and on a journey about being on my own. Some of the things Paris and Hill mention in that article resonate with an exhibition I saw at Cirrus Gallery, titled ‘This is Not a Connection’. I really enjoyed the exhibition, and picked up on some interesting performance work that I want to research and explore further (that’s for another blog post). All of this reminds me of how important it was for me to have a car when I was in Palestine. And how much that vehicle allowed me freedom and movement around the West Bank. It reminds me of ‘Speed Sisters’ (2015) – the documentary about an all-woman car racing team from Palestine, and how proud I felt when I saw it.